Mommy and Daddy inspired me to be a performer. I get my flow from Daddy, my singing ability from Mommy, and the camera stuff from both. That’s just what happens when you hang out with the Smiths! How cute is Willow? And how much does she look like her dad? I like that she called her parents mommy and daddy. 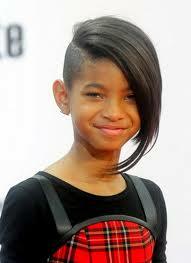 It hints that she’s not growing up too fast despite the record deal with Jay-Z and megastar parents. I also like her wacky sense of style. This girl is gonna be huge! Most people get up in the morning and throw on a pair of trousers and a top. But it was just another day for Lady Gaga, as she got up, rolled about in flour, put on a bikini, rolled about in flour some more, stuck a load of pearls on her face and body, rolled about in flour and finished the look off with a hat and jacket. And then probably rolled about in flour again.